The church door is locked at 7pm, so visitors need to contact the Tower Captain, via telephone (see below), for access. The group also ring for morning service 9:20 – 10am on the 2nd Sunday of each month. The links between Hucknall church and the Byron family are noteworthy in the history of bells in the church. A church was built in Hucknall in the 11th Century by Ralph de Burun, a landowner, whose family name was changed to Byron during the 12th Century. After the dissolution of the monasteries in 1539, Newstead Priory changed hands and became the property of Sir John Byron. He is supposed to have worshipped in Hucknall Church and to have presented the church with a bell, believed to be the Angelus Bell from Newstead. This bell, bearing the inscription “Ave Maria”, still hangs in the tower, although it is not a part of the 8-bell ring which people hear today. In 1639, his great grandson, also Sir John, gave another bell, this being his gift as the Lord of the Manor, to celebrate the centenary of the Reformation. 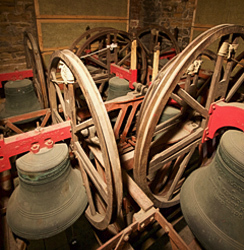 A third bell was added in 1749 and all three were chimed together right through until 1957, when preparations began for the installation of a new ring of 8. The two younger bells were melted down and their metal was used towards the founding of the new ring. 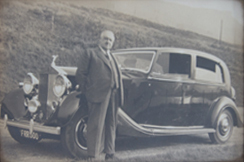 The funding for the project came from a single donation by a parishioner, Mrs S R Raynor, this gift to the church being a memorial to her husband, Mr H M Raynor. a one-time choirboy at the church. 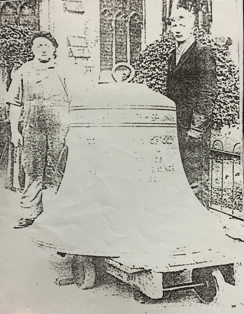 The ring that resulted, all 8 bells being founded by John Taylor of Loughborough in 1958, have proved to be an excellent example of the bellfounder’s art. 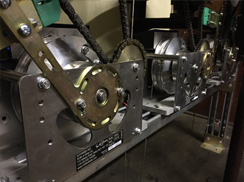 Details are given below, the weights being stated in hundredweight-quarters-pounds. The bells hang in the church’s 4-storey West tower which has a stone spiral staircase right to the top. A rope with small sally hangs in the front corner of the ground floor, this being the means of chiming the Angelus bell, usually used for the 8am communion service. Just 23 steps take you to the first floor ringing chamber – the room where the ringers stand to ring the bells. 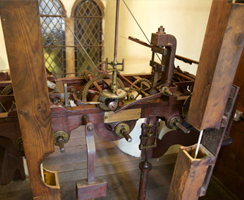 The clock chamber on the next floor contains the workings of the once mechanically driven clock (electrified late 2015), dating back to 1884 and also contains 8 enclosed wooden boxes, (2 of which can be seen in the photograph of the manual clock mechanism, right), reaching from floor to ceiling, which carry the ropes through to the belfry, above. Here, the bells hang in a one level metal frame with modern fittings, including Hastings stay devices. A further short flight of steps leads to the tower roof with its central flag pole, where excellent views of the town and surrounding areas can be obtained.